THE FAMOUS Chinese philosophical symbol Yin Yang describes how seemingly opposite forces are interconnected and interdependent in the natural world. It also forms the basis of a new show, Yin Yang, from the Chinese State Circus, which comes to Galway’s Black Box Theatre on Tuesday April 16, for two shows, at 5pm and 8pm. The shows will feature the formidable Shaolin warrior known only as The One, sourced specifically by director Phillip Gandey. 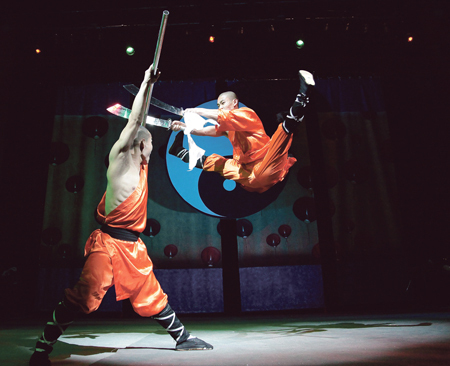 Yin Yang will feature acrobats defying gravity in an array of elaborate, explosive, and highly choreographed presentations of power, poise, and agility. There will also be plate spinning, parasol juggling, and a bicycle act, in which 10 artistes manoeuvre onto a single bicycle. Another highlight will be The Oriental Swan, a fusion of ballet, physical strength, balance, and inspiring creativity, where a ballerina pirouettes on the shoulder of her partner then dances en pointe on his head and shoulders.